The Dansko Grey Suede from the Halle collection. Looking for casual comfort with a dash of refinement? 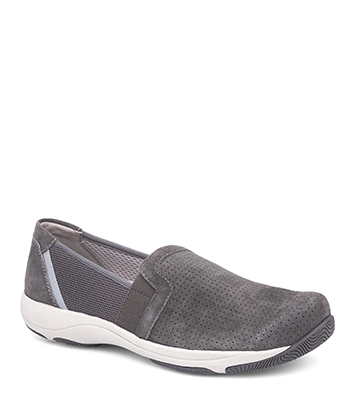 Then the Halle slip-on shoe is just what you need! Part of our popular Halifax collection of athleisure styles, this laceless shoe fits great thanks to stretchable goring on the vamp and soft leathers that mold to the foot. Perforated uppers and a stripe detail add to its sport style.